Digital Signage Solution provides central network to all the screens installed in the hotel and monitors the entire network flawlessly. 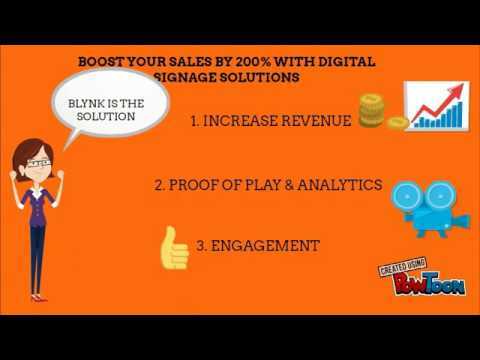 The blynk digital signage platform configure screens, create layouts, assign, modify and delete content. The solution also provides real time reports, dashboard, email alerts, triggers and notifications. Moreover, the screen monitoring software offers high quality, cost-effective and comprehensive solutions such as software, hardware and customized templates. Landscape can be used where a wide view area is needed. Portrait is preferred for editing page-layout work, in order to view the entire page on the screen at once without wasted space along the sides, and where it is useful to see a maximum number of lines of text. Customer Value: Based on type of content, You can choose desired screen orientation. Helps to optimally use the space available for content as needed. Helps you to design custom templates to create your own signage or Split-Screen based on advertising or specific content needs. Customer Value: Helps to design screen to suit various advertisement. Split screen allows to engage viewers along with pushing ad. You can choose to have interactive signage systems to support specific scenario. For example guest can explore information about various services offered, through an interactive signage system. Similarly You can imagine various other such scenarios that can contribute to their guest experience Customer Value: Educate and engage guests while they are in common areas about various offerings by you or your partner brands. Ease of information discovery as per guest interest. The content delivered live over the Internet, requires a form of source media. Customer Value: 1.Can stream live video of an event happening at hotel to its guest. 2.Engage guests through streaming live sports, music concert etc. Allow Android users to download YouTube videos and watch them offline. Customer Value: 1.Hotels can play videos whenever required even without internet access. Allows to use a family of standard web feed formats to publish frequently updated information. Customer Value: 1.Simple and fast way to manage updates. 2.Delivers relevant information for guests. If you want to know how your current product is being used and who all are using effectively, We provide custom designed usage metric and other reports as desired. Customer Value: 1.Helps in addressing product implementation and usage related gaps to get desired value. 2.Optimize operational efficiency. Hotels can request to have privately hosted smart signage solutions as per their IT policy. CUSTOMER VALUE 1.Available even without internet through your LAN. Affordable enterprise for Digital Signage platform Centrally network all your screens and manage, monitor the entire network with ease. Configure screens, create layouts, assign/modify/delete content and Schedule/Reschedule content. Real time reports, dashboards, proof of play, email alerts, triggers, notification and customization. Q. How fast can our app powered by Blynk Hotel be launched? Q. What is the minimum Internet speed and bandwidth requirement to use the app? Q. What happens if Internet connection is down? Will the app still work? Q. Can the pricing change in future?